“I’m not good with computers”. ARGGG. Have you ever found yourself saying those words? Boy oh boy. These words are spoken a lot. So often in fact, that I would say that it is probably creeping up to claim the silver medal in actor excuses. Coming in second only to the ever popular gold medalist “My agent isn’t getting me out”. So since this has become the new darling in The Excuse Olympics… we must take a moment to address this ever growing actor challenge. 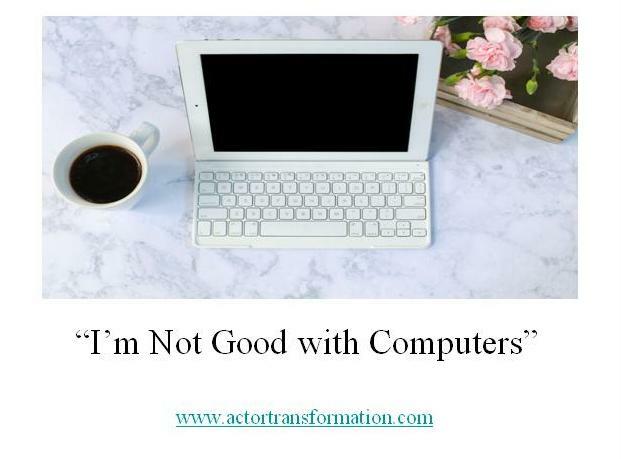 If you often find yourself saying …“I’m not good with computers“ … It is time to remove this phrase from your self-talk vocabulary and to start adopting a plan to use technology to help your career. The reason so many actors repeat this mantra over and over again is because new things that we don’t understand can be scary. When someone labels themselves as being “bad with computers”, they kind of feel like they are off the hook. When using these words… it is perceived as a magic hall pass so you don’t have to learn a new skill that scares, intimidates, confuses, or just plain annoys you. There can be comfort in feeling like other people are just luckier than you. Maybe they were born with superpowers that made them understand computers better than you? Or you might even believe that they are flat out smarter than you. That way it is easy to run and hide when dealing with online directions that you don’t want to read or a website that you think you cannot figure out. I hear these words all the time. Truth be told, I’ve even said the words myself. But at the end of the day, you need to be able to do a certain number of things online for your career as an actor these days. And sometimes that requires some growing pains. Your desire to be a successful actor must outweigh your desire to stay in your comfort zone. And here is the thing about computers… (And everything else, for that matter) … NOBODY is born knowing how to do any of it! Most people who seem to understand something that does not come easily to others, just probably put in more time in learning that particular thing, where others have not. That’s all. If someone has millions of followers on Twitter, it is usually because they have put quite a bit of time and effort in using it. And Twitter might not be your thing…. And that is ok. We all have different strengths and weaknesses. You know how to do something that others would have a hard time learning. But consider this… you need to at least cover the online basics in an actor’s career … just so you are not left in the dust. The entertainment industry is looking actors up online more and more when considering whether or not to sign or hire them. And some of your competition might be willing to spend the time and effort learning and doing the tasks that you are not willing to do so they will get the benefits that you will not get. Pretty simple. Computers aren’t going anywhere. Online marketing isn’t going anywhere. It is just going to get worse! Ha! So if ya can’t beat em…join em! You might as well make some kind of peace with it sooner than later… right? Ok… So the first step? You figured this out… and you are completely capable of figuring out tons of other things that currently make you nervous or confused. Make the choice that you are not going to get overwhelmed. When feeling like you want to throw your computer out the window, just take a second and take a deep breath. Read. Search for what you need. Read again. Rinse and repeat. Very often I see actors who create all kinds of drama in their careers just because they didn’t read the directions, or the website, or the email, or the audition description, or whatever. They are so busy being scattered and flustered that they miss out on career opportunities and get themselves labeled as flaky in the process. A good way to think of website and computer frustrations is that the answers are there. Even if they are not right in front of you… they are somewhere. Other actors have figured out answers to their computer woes … and so can you. Commit to learning one new thing online per day. You cannot become a computer expert overnight… but what you can do is spend 10 minutes reading the directions on an actor’s website that freaks you out. Or put in 5 minutes a day improving your IMDb page. Or just go and grab your full name on a social media site that you have been meaning to get registered with. (Do this one for no other reason than so someone else doesn’t grab your name!) This daily ritual will also make you feel the joy of progress. It is important to have career successes every day so you have something to build on. No matter how small the success is … that is how you get stronger. What’s the old saying? “How do you eat an elephant? One bite at a time”. Take the first tiny step. If you keep learning and keep building this habit…. You might soon find yourself saying… “Hey…I’m pretty good with computers”!